UTC special teams coach Mike Yeager directs players on the first day of spring football practice at the University of Tennessee at Chattanooga's intramural athletic fields on Tuesday, March 19, 2019, in Chattanooga, Tenn. 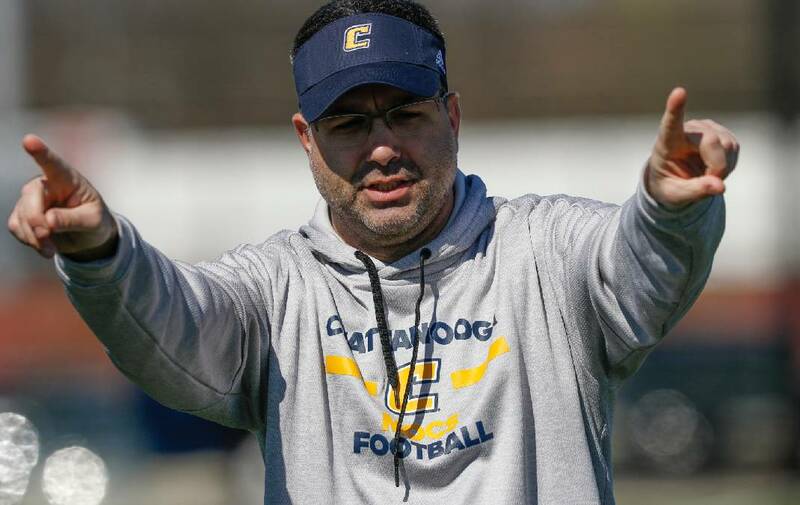 The nearly monthlong get-acquainted tour for the University of Tennessee at Chattanooga football team and staff began Tuesday at the school's intramural field. It was one of four locales that will host the Mocs and first-year coach Rusty Wright and his staff due to flood damage sustained at Scrappy Moore Field. While the locations may change, the main goals will remain the same. "It will be a chance for us to get to know them and for them to get to know us," said Wright, who replaced Tom Arth after Arth was hired as head coach at Akron in December. "We've had morning workouts and things, but now the fun part starts when you get to work on football. Just getting to know what we can do. Getting a little better fundamentally. These kids trying to understand schemes and tempos and how things are going to be. Those are my biggest goals for the spring." 1. How much does the current personnel affect offensive and defensive schemes? Quite a bit, according to Wright. With a seasoned offense that returns all of its linemen, more physical sets can be expected. Otherwise, a lot of what the coaches see over the next three weeks will determine a good deal of what will be run on Saturdays in the season. "The biggest thing is, that's why we are out here a little bit, too, to see what these guys can do," Wright said. "If some of their skill sets allow us to do different things, that's what we'll do. I don't want to pigeonhole us into one (scheme) just because we are trying to see what we have. Jeffery Wood, for instance, is a different type of back than Tyrell Price, so we can do different things in different sets with each of them." 2. Who replaces graduated production on the D-line? The defensive front was the strength of the team a year ago, leading a unit that was first or second in most categories within the Southern Conference. Gone are league defensive player of the year Isaiah Mack and run-stuffing tackle Derek Mahaffey, who combined for 140 tackles. Freshman All-American Devonnsha Maxwell, who was second to Mack with 5.5 sacks and 6.5 tackles for loss, started five games in 2018 and is the lone sure thing. The other returning six linemen combined for 18 tackles, though two of them, Tavi McLean and Mychal Austin, are redshirt freshmen. Seniors Tyler Cross, Tristan Mann and Telvin Jones have experience. A name to watch in August is incoming freshman Marlon Taylor (6-foot-3, 275). 3. Who comes out ahead in the backup quarterback competition? The Mocs have an established starter returning in junior Nick Tiano, who took every snap last season and passed for 2,710 yards and 15 touchdowns. The competition behind him, though, is wide open and should be competitive. Graduate transfer Drayton Arnold, who has two years of eligibility remaining, and senior transfer Chris James joined returning junior Dominic Caldwell in drills Tuesday. Arnold is a former three-star prospect who passed for 8,500 yards in high school. James, a Gilmer High School graduate, has the size (6-3, 220) and athletic ability to see action somewhere on the field. The four had good moments Tuesday as Wright and offensive coordinator Joe Pizzo gave each time with the first team. "I saw some good things from the quarterbacks," Wright said. "You have to get them all ready. It's Nick's third scheme in three years, going from Mississippi State to Tom to us, so it's important for him to get snaps. We do need to find out who our guys are." Tiano was upbeat after day one about the makeup of the quarterback room. "We've got a great group of guys," he said. "We're four-deep this spring, which is the most we've had since I've been here and four great guys. It is a blessing to be able to stay healthy, but these guys are working their tails off to be ready every day, and it gives me a lot of confidence in them." The QB group will add three-star recruit Gio Richardson this summer, a dual threat from Florida who has every intention of contributing right away. 4. How many old faces will be in new places? Wright has stated on several occasions over the past three months that he puts a premium on players who are versatile. It was shown in the staff's first recruiting class. Finding and developing versatility with his returning players is a major part of spring drills, though Wright says he and his staff have to be careful with complicating matters too much too soon. "We run out of defensive linemen and we've only got a couple of linebackers going at any one time," he said. "Offensively the numbers are OK, but defensively we are thin in a couple of spots and we may have to move some guys around just to practice. "You don't want to move guys all the time, especially with a new group. That's the biggest concern. We want to develop versatility, but you want to leave them in one spot and let them get comfortable instead of moving them around so much." 5. How are players adjusting to the new staff? Wright admitted to letting a few things go Tuesday that he won't as the spring goes along, but he was quick to praise the effort shown in the two-hour workout. The athletes, too, seemed to accept the expectations of the staff. "It was a very good day, a lot of guys flying around the ball," junior defensive back Jerrell Lawson said. "I just like how the coaches were very detailed and, even though it was our first day, they didn't let much slide. These coaches don't believe any taking any shortcuts. They believe in doing things the right way, the efficient way, and we appreciate that in them." Contact Lindsey Young at lyoung@timesfreepress.com or at 423-757-6296. Follow him on Twitter @youngsports22.